Riess's team, which includes Stefano Casertano, also of STScI and Johns Hopkins, has been using Hubble over the past six years to refine the measurements of the distances to galaxies, using their stars as milepost markers. 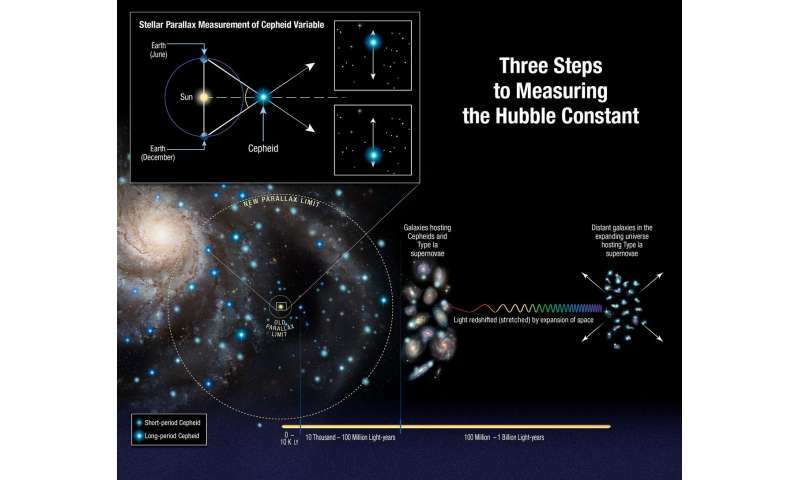 Those measurements are used to calculate how fast the universe expands with time, a value known as the Hubble constant. The team's new study extends the number of stars analyzed to distances up to 10 times farther into space than previous Hubble results. But Riess's value reinforces the disparity with the expected value derived from observations of the early universe's expansion, 378,000 years after the big bang - the violent event that created the universe roughly 13.8 billion years ago. Those measurements were made by the European Space Agency's Planck satellite, which maps the cosmic microwave background, a relic of the big bang. The difference between the two values is about 9 percent. 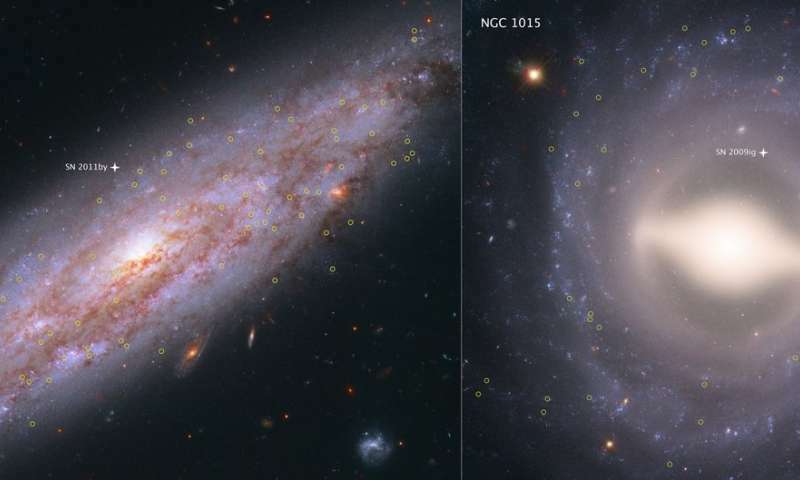 The new Hubble measurements help reduce the chance that the discrepancy in the values is a coincidence to 1 in 5,000. Take the center of the birth of the universe and go radially outward in your mind's eye which always is Newtonian and not Einsteinian. The universe's Hubble Constant is now least a partial differential function of time and distance from the radial center and increasing such that so far as we know, the third derivative of the equation of distance from CofU/t exists and is non-zero. Therefore at some point the velocity of stars at the outer edge will have a velocity of 'c' with respect to the universe's center and will no longer accellerate cuz' they, according to Einstein, KNOW that the kosmik-kops are gonna get em' if they dare speed faster.. This will become the universe's shell, the spot where all galaxies then pile up. This will make an enormouse dyson sphere at the 'edge of the universe'. Soon this Dyson sphere becomes an enoumous black hole and the universe impodes a finite time trom now.....maybe....sooooon! Same way it inflated and implodes in instant of time...ENDO! The original prediction was that expansion started out extremely fast and slowed. The evidence was expected to be found in the slowing rate but instead it is speeding up. Researchers stuck to the old formula and ignored the evidence, assuming instead that some magical God-like force must be causing the universe to behave differently to their prediction and so out pops Dark Energy. Perhaps a new model needs to be formulated rather than ever more exotic patches to the old model? Even Dark Radiation (dark light) has been hypothesized, along with variable light speed and other exotic solutions. Water to ice is a unique phase change. It expands rather than shrinks. Expanding space is movement to a phase where time becomes irrelevant. Do the thought experiment. Have we determined that the expansion rate is equal in all directions yet? It could be that there exists particles that repel other particles. They would not be visible close to us because they have been pushed away, but they result in the universe expanding. Already solved. Check out the Primer Fields series on my Youtube channel Benoît Mussche. The universe is largely magnetic in nature, and LaPoint proves it with experiments. If we are a holographic projection of the information on the event horizon of a black hole, could dark energy and it's change be something to do with the black holes' continuing evaporation? We try to do too much with very limited data. We have only been observing the universe for at most a few hundred years, not even a nanosecond in the overall age of the universe. What we see in this ultra limited view is not enough to extrapolate the entire history of the universe. We have not observed more than 90% of the universe and we don't even know what composes 95% of the mass in the universe. To make such confident and all encompassing conclusions is not warranted. We must constantly remind ourselves of how much we don't know rather than thinking we know much more than we do. Could this be the first hint towards the mysterious dark matter/energy story? Osiris1 you don't understand Einstein (but don' worry, just try hard and you will). First thing there is no "center of the universe". Secondly, Einstein theory does not say that you can not move faster than c in respect another object. What it says is that you can not "accelerate" to a faster speed in respect to it. But if space itself is expanding you are not accelerating. In this way you are moving faster than c in respect to the far away galaxies, although once they move at c you will not see them anymore . Of course they are happy to invent new physics and faerie dust and such, but will never, ever reconsider the original hypotheses. 2) Circuitous arguments/logics lead to self-determined GIGO 'confirmatory' backup checks for original wrong/naive 'measurement'. As in above article, using redshift data to check results of 'distance measurement' which assumed redshift was correct in the first instance. 3) Cepheid and Type Ia 'standard candle' supernovae NOT STATIONARY or SAME (local conditions/contents vary). So, fast-moving Cepheids and Supernovae 'features' can be RED- or BLUE-shifted, depending on PROPER MOTION (ie, radial velocity peculiar to EACH case); not to mention known variability in local dust/dynamical effects on light brightness/shifting locally/along line-of-sight path from there to here. 4) CMB created NOW all over! BH EH region EMIT EXTREME REDSHIFTED MWs. That link showed how peculiar velocities MAY NOT MATCH the 'host galaxy' determined 'distance/velocity; hence individual cepheids and supernovae may have different red/blue shifting than host galaxy. So, the message is: STOP; and think what naive/simplistic/circuitous/wrong assumptions and models are doing to so-called 'scientific' observations/conclusions. GIGO is REAL; and it has infested the literature/methodologies/conclusions from supposedly 'competent objective' astrophysicists/theorists/experimenters. Time to 'purge' that GIGO; and RE-DO, RE-THINK, from reliable facts/principles. @ Really-Skippy. How you are Cher? I am good and getting better, thanks for asking. You been saying that thing for years. That is a new one to me. Is that one of the theories from the Earthman Playclub? GIGO, it has a nice ring to it, GIGO with Volumetrifications. Thisis an old claim of Reiss, and - unless I am mistaken - the peer review published paper makes none of the claims about discrepancies. It does make some other cosmological claims apart from the calibration based on very sparse data. So nothing tangible here; maybe this will affect consensus, maybe not. Meanwhile the interesting first gravity wave distance measurement put the expansion value right in the middle of the purported discrepancy between the concatenated data (Planck) and the isolated supernova results (Reiss et al). But of course that data is even sparser as of yet. @bhj: "Have we determined that the expansion rate is equal in all directions yet?" @Osiris1, grandpa, ursiny, stein-age: "Take the center", " at the center", " started at a single point", "the edge". Amazingly that so many do not understand the geometry of the universe [ https://en.wikipe...ceptions ]. The Hot Big Bang is a point in time, not in space, when inflation stopped and its potential energy was converted to hot matter. @RKS: "The original prediction was that expansion started out extremely fast and slowed. ... Researchers stuck to the old formula". And so the expansion does, whereafter its rate goes up again. Even the pre-inflationary big bang models were good approximations for the first phase. The reason why we have inflationary big bang models is - obviously - because scientists did not stick to the old formula, albeit dark energy - the cosmological constant - *was* kept. @mackita:"It can be explained by dark matter surrounded by massive objects." Obviously no; which is why you do not present a peer reviewed paper on that subject. And that would not hold up against dark matter observations anyway, which include *all* dark matter and also exclude the baryonic content to a few percent at most. "This is result of occupational driven attitude". Of course it is, as it is meant to be. Did you think science, which gives us so much, was free? These things are often said; amazingly that so many do not understand the economics of science. @BPF: " The universe is largely magnetic". [Looks around the room:] Obviously no; which is why you do not present a peer reviewed paper on that subject. I wonder is there are large clusters out there that we cannot see due to the bending of light? They could be there but invisible because the light and radiation has been bent enough to miss our orbit. ...that should be "neutron star merger", of course. Sorry. I have to agree with reality check. GIGO is garbage in garbage out. The only reliable form of distance calculation is parallax because it does not depend on red shift nor brightness. Unfortunately, it can only be used for objects within a few thousand light years. The biggest assumption scientists make is that the universe is expanding. There is no question that everything is moving away from each other, but no reason this couldn't be from proper velocities rather than expanding space.